The days where people would travel from dealership-to-dealership chatting with reps and conducting research in person has transitioned online. Instead, consumers navigate dealer websites, review platforms, social networks, blogs and other resources to make an informed decision when purchasing their vehicle. 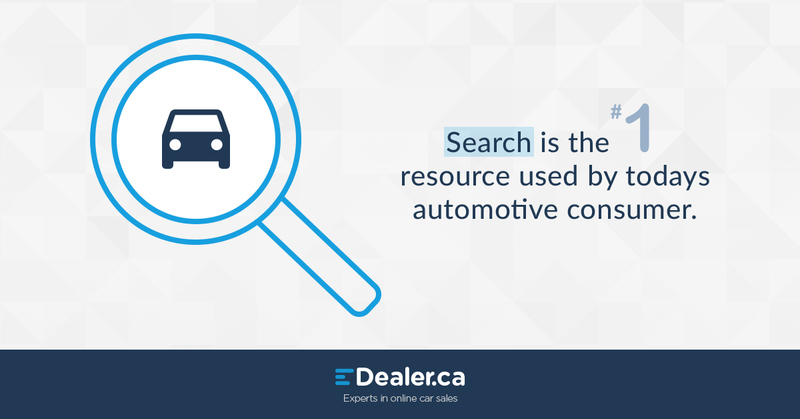 Search is THE biggest tool at consumers disposal when conducting research throughout the car buying process. 94% of consumers turn to search when beginning their research and spend over 18 hours online throughout the process. So how can you leverage these searches, turn them into leads and ultimately customers? The answer is simple: Search Engine Marketing (SEM). Search Engine Marketing is a great way of turning consumer’s online research into valuable leads. 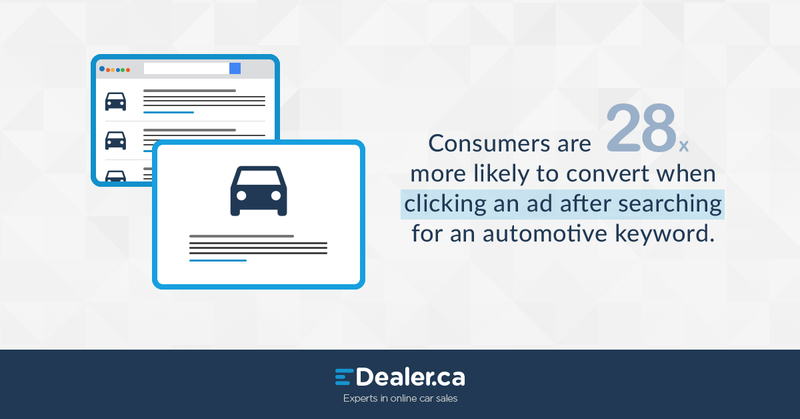 Data suggests consumers are 28 times more likely to convert when clicking an ad after searching for an automotive keyword. Perhaps the biggest value in SEM is not the leads it generates, but the data and insights that can be inferred from that data. For instance, data may suggest that you’re getting more dealership calls between 11:45am – 1:30pm from mobile devices on weekdays. To take action on this lunch break insight, we can make changes to your SEM campaigns to increase bids on mobile devices at these times to maximize the opportunity for lead generation. The best part about Google Certified SEM Management is that you don’t need to worry about the technical inner-workings of Pay-Per-Click advertising. These campaigns are dynamic and flexible, meaning that as you sell cars and they’re removed from your inventory, your ads are dynamically updated to reflect your existing inventory. More importantly, we make sure these ads are shown to the right consumers at the right time. When consumers in your DMA are using keywords to search for vehicles or service that are relevant to your dealership and inventory, they’ll be served a highly targeted ad. Using your existing web visitors, we can ensure that your brand stays top-of-mind throughout the car buying process using remarketing. These ads will follow consumer’s throughout their car research process as image ads and will only be served to a consumer who have visited your website in the past. With nearly 10 years of experience managing automotive SEM eDealer been able to define successful strategies for all types of automotive dealerships. 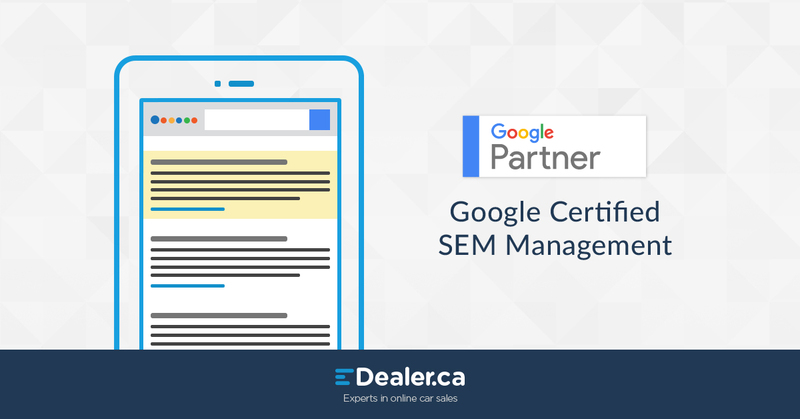 Make sure your dealership is there when it matters most with Google Certified SEM Management. Ready to capitalize on your consumers searches and turn them into measurable, valuable leads? Give us a call or shoot us an email.